This is the second article in a two-part series on planning and designing your herb garden! Part I – Tips for Making An Herb Garden Plan – discusses planning your garden – choosing a location, prepping the soil, and gathering plants. Part II – Designing Your Herb Garden – discusses design ideas for theme gardens and color selections. There are many books written on the various types of herb gardens. Invest in at least one good book on growing herbs that includes garden tips, what herbs to use for what purpose, and harvesting guidelines. Several types of gardens with plant suggestions are outlined below. 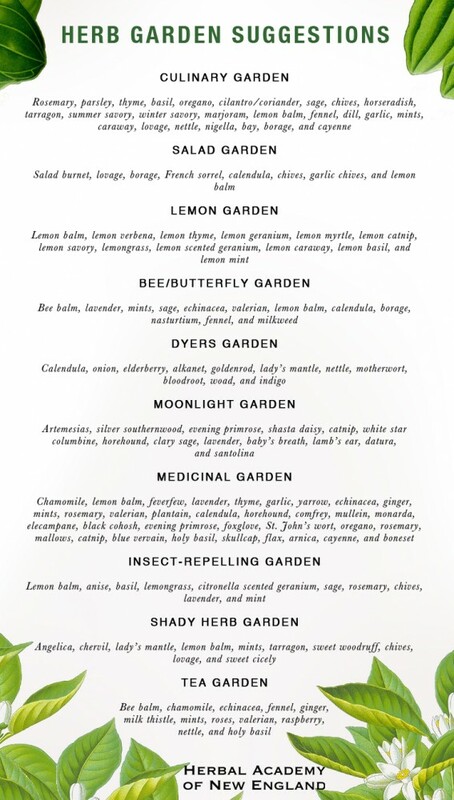 You may notice that some herbs appear in more than one garden type. This is because herbs are versatile and have many uses. Historically, a culinary garden is planted as close to your kitchen door as possible. This allows you to step outside and harvest the particular herb you need for the dish you are preparing. If you have too much shade, or your hardscaping won’t allow you to plant right outside your door, you can add culinary herbs to the vegetable garden or plant a container garden instead.. Culinary gardens are generally governed by what the planter uses the most. Be creative and try something new each year! If you love salsa, plant tomatoes, peppers, cilantro, onion, and garlic in your garden. A Mediterranean herb garden might include oregano, marjoram, garlic, onion, basil, rosemary, turmeric, and cumin. Maybe you’re only looking for fresh greens for your salads. An herbal salad garden could contain salad burnet, lovage, borage, French sorrel, arugula, spinach, chives, garlic chives, lemon balm, and mint. Many people have cottage gardens without even realizing it! A cottage garden is an informal garden, usually circular. It does not have “rows” of plants, but rather dense groupings of traditional flowers, herbs, vegetables, and other edibles. This is your grandmother’s dream garden! Plant groupings are perennials that are often repeated throughout the garden, resulting in low-maintenance plantings once established. Seating may include a vintage bench or Adirondack chairs. Wattle fencing, arbors, lattices, and well-worn paths are often incorporated into cottage gardens. Overall, a cottage garden gives the appearance of something easy and un-designed. Foxglove, hollyhocks, columbines, lamb’s ear, liatris, alliums, lavender, monarda, lupines, echinacea, bleeding hearts, lady’s mantle, and yarrow are all good choices for a cottage garden. A tea garden might be a section of an existing garden or a garden unto itself. Clearly labeling plants can help you and your visitors get the most out of your tea garden. Chamomile, lemon balm, mint, monarda, rosemary, thyme, catnip, echinacea, (edible) hibiscus, and holy basil all work well in a tea garden. Bees are dying in unprecedented numbers, and no one can pinpoint the exact reason(s) why. What can you do to help keep bees alive? Limiting pesticides and other chemicals in your yard can help, but you can also plant what these creatures need to survive. Bees love monarda (bee balm), lemon balm, echinacea, marjoram, thyme, sage, mints, chives, lavender, borage, dill, nasturtiums, roses, red clover, oregano, and evening primrose. Gardens full of plants used for dyeing fabric are becoming more popular. Dyeing is a process that requires more than just the plant material. Mordants are used to fix or set the dye. Different mordants result in different colors from the same plant. Fabric dyeing is a fun craft. If you want to learn more about using natural plant dyes, find a good book, or look for an experienced person to mentor you. Look for dyers at re-enactment camps, in historical groups or parks, or within herb organizations. Here are some plants to get you started in your dye garden. The most common color achieved with each plant is included; however, remember colors with vary depending on which mordant you use. If you have a vegetable garden and want to include vegetable plant dyes, you might to plant onions (yellow), berries (reds to pinks), beets (red), and red cabbage (purple, blues). Paths should be large and smooth enough to accommodate a wheelchair, cane, or unsteady feet. If possible, a circular design works best. The choice of plants is important. The person’s familiarity to specific plants is as important as the durability of the plants themselves. Aromatics are a good choice and may awaken memories. Plants that have any toxic parts should be avoided. Roses are lovely, but thorns can be a problem. Waist-high raised beds allow for the elderly or those in wheelchairs to participate in the family gardening. You can purchase raised beds ready for assembly, or you can construct your own. Telescoping tools are now available in many garden centers, too. A working garden might include aromatic herbs, flowers, or vegetables. Disabled gardeners who harvest and use plants in their own care often find this work particularly gratifying. Keep everything to scale. Find a focal piece, such as a fairy, furniture, or a dwelling, and build your garden around it. Gardens can be any size. You can plant a fairy garden in a container, in a back corner in your garden, or in an area around a fallen tree. Your fairy garden can be formal (with purchased fairy castles or homes, bridges, stone walls), or you can use found items, such as an old drawer or stump. Fairies love shiny things, so be sure to include a gazing ball (a ‘shooter’ marble glued on a golf tee), a mirror, or a shiny stone. Iron will hurt fairies, so avoid putting anything in your garden made of iron. Fairies, much like butterflies, need some place to warm their wings. A large, flat rock is a perfect choice. Better yet, use a rock with a hollow that collects water. Be sure to leave a crumb of cake and a drop of wine in your fairy garden from time to time to keep the fairies from becoming mischievous. Use the best purchased soil mix you can afford. Some now have 90- day fertilizers. The plants in these containers will use all soil nutrients in one season or less. For the best results, use a good potting mix, not dirt from your backyard. Containers need to be watered more often than plants in the ground. Containers can be reused from year to year. Clean out all debris and old soil and soak pots in a solution of one part bleach to ten parts water for a few hours. This should eliminate any plant diseases from the previous year. When you pull your pots from the bleach solution, rinse them thoroughly and let them dry completely. 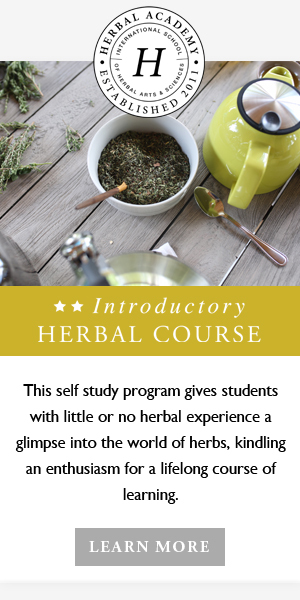 Many herbalists will eventually grow their own medicinal herbs. The advantage of growing your own herbs is that you will know the origin of your plants and seeds, and you will know exactly how your herbs are grown. Medicinal herbalists can gain a great deal of knowledge from working directly with their own plants. Growing your own herbs will help you see how your plants react to various conditions and what makes your plants thrive. These gardens are as varied as the folks who tend them. Some herbs are trees or bushes – elderberry (only use S. nigra and S. canadensis medicinally), slippery elm, wild cherry, hawthorn, willow, and linden are a few plants you might find in an herbalist’s yard. Medicinal gardens can be general or specific to an area or ailment. A headache garden might include meadowsweet, willow, feverfew, and lavender. Ginger, chamomile, catnip, mints, dill, marjoram, coriander (the seeds of cilantro), or caraway would be good plants for digestion gardens. Anywhere there is danger of frost, ginger should be grown in a pot. Take a ginger root and break off a piece with an eye (like a potato), plant it in good soil about a thumb-depth down. Keep it watered but not overly wet or dry. The process takes about eleven months – you’ll see a tall grass- like plant come up, and if you’re lucky, a flower. When it dies back, dig up the root – your new piece of ginger. It won’t be as strong as the original root, but still usable. Pots of ginger can be put outside during the months where there is no frost, but should be brought in at the first hint of winter. Turmeric can be grown the same way. Herbs that might be considered in a nerve or insomnia garden include chamomile, skullcap, hops, lemon balm, lavender, oats, holy basil, dill, valerian, California poppy, and passion flower. A garden to prepare for the flu and cold season might contain elderberry, yarrow, garlic, echinacea, boneset, thyme, elecampane, horehound, or monarda. Plants in colors next to each other on the color wheel (i.e. blue and purple, or pink and red) will harmonize and are easy on the eyes. Monochromatic plants – various shades of the same color are a good place for beginners to start. A monochromatic scheme gives your garden a sophisticated look. A wide variety of colors – a polychromatic scheme – can sometimes appear chaotic if you don’t have a solid design. Blues, purples, and greens are cooling and relaxing colors. Reds, oranges and yellow are warm, exciting colors. Adding a yellow plant makes the plants around it appear more vibrant. Adding a white plant softens the colors of the plants around it. 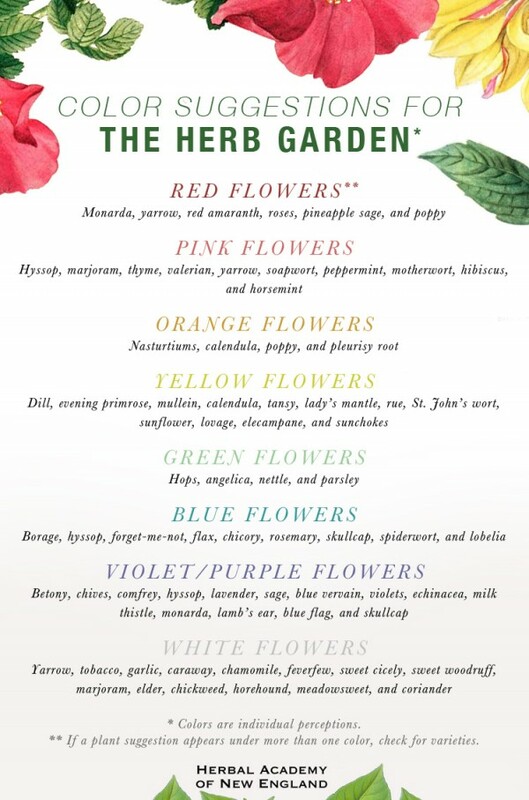 To get you started on herb colors, a list has been provided, as well as a list of different types of gardens with plant suggestions. Grab a piece of graph paper and a pencil and get start planning. Spring has sprung!